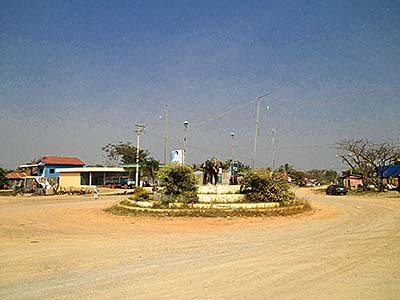 Veal Veng is a district town in the Cardamom Mountain Massive and belongs to Pursat Province. It's actually a village, consisting of not much more than a crossroads with an elephant roundabout. 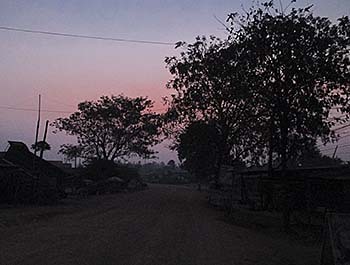 The whole region was one of the last strongholds of the Khmer Rouge until the late 1990s. 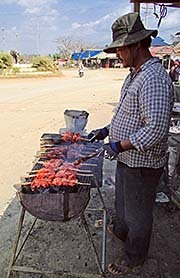 Sometimes the place is also called Pramoey, and appears on some maps as such. 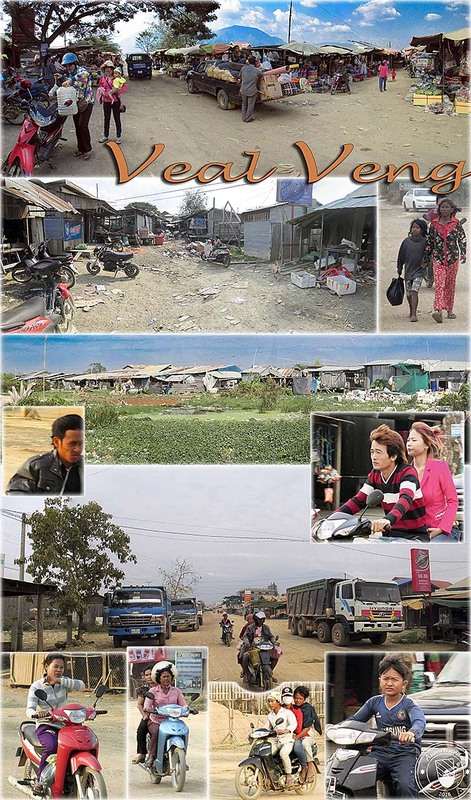 Veal Veng is then only the district's name. On one of my maps a Veal Veang appears some kilometers apart from Veal Veng. Since it's such a remote spot in the mountains I am sure that five years ago there was very little traffic in the place. Now there is considerable traffic here. All the roads are dirt roads, and in dry season any vehicle whirls up heavy dust clouds (while in rainy season it will drown in mud). And there are many, a lot of motorbikes, some cars and always big trucks, who make their way through the town center. In another five years the main roads in Veal Veng will be paved and traffic will have trippled. The road between Pursat and Veal Veng has been broadened and is under construction over all the length. A lot of bridges over rivers and creeks are included in the roadwork. 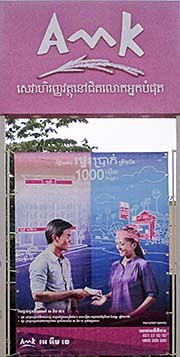 There is no beautiful or at least half-way acceptable city or town in Cambodia. They all are crappy. Here in Veal Veng one can see how urbanization starts. It's just at the very beginning, but imagine it a thousand times bigger and you have another Phnom Penh. The two biggest roads who come together in town have a number of sideroads. They again have some side-sideroads. All the wider surroundings of the place who are easily accessable, means are not to steep terrain, have been deforested already. New villages grow where the rich habitates of tropical rainforests spread out short before, wooden houses, yet in the size of hamlets. Most of the deforested areas have been reforested by teak forest monocultures. 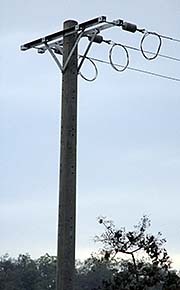 Occasionally banana plantations have been installed or savannah regrew. 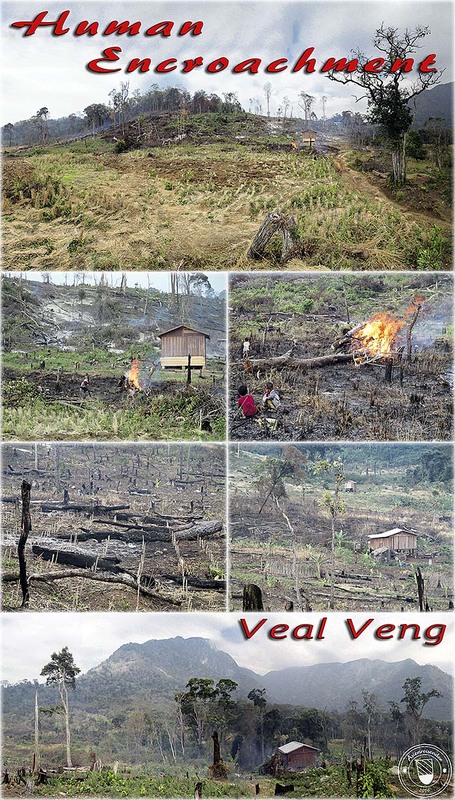 All around are the forests burning because arson has set on them to expand arable land. The air is thick with a haze due to all the smoke. Veal Veng is apparently a buzzy hub for wood trade, and certainly also one for wildlife. In town are many carpenters who are busy all the time. All the precious trees far around have been already cut, and more and more dirt roads penetrate ever deeper the mountaneous surroundings, targetting the biggest and most valuable trees. 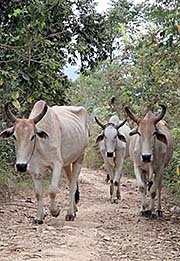 Locals go with their STIHL motorchains deep into the virgin forests and cut them, carrying the wood out. They are the pioneers who go first, before the rest of the forests fall victim to arson and are changed then into more plantations and more villages for the rapidly growing population of baby-booming Cambodia. Banging, cutting and sawing are part of the permanent noise background in Veal Veng. The place is booming like those in the American west in the times of the gold rush. The workshops are specialized in bulky furniture. Walking around town in the countryside there is always the sound of a motorchain from anywhere. STIHL motor chainsaws are a favourite tool for tree cutting. When in the past a group of five man ned a day to cut a big tree, with a STIHL motor chainsaw one man makes it in an hour. It's insofar a desastrous tool for the forests. Made in Germany, by the way, so far it is not counterfeited in China. The best protection for the nature, as ironically it is, give the landmines who were laid by the Khmer Rouge. The areas here are heavily mined. Clearing the mines opens the race for the environmental destruction. The place gives on the first, second and third glance a very bad impression. The place is, as any Khmer place, extremely filthy. Everywhere is garbage around, particularly at the market place. Also the non-stop din is more than only annoying. It's not only the usual traffic and building-site din, but moreover the omnipresent TV's, mobile phones and loudspeakers who are used to perform a permanent artificial noise background. I saw a whole family watching a dull musical in TV before 6am. In the restaurant the guests watched a boxing match in the early morning in high volume. These people are scared of silence; they can not stand it nor any natural noise. It must be the crap from the culture industrie with it's false and ridiculous messages. The din has the function to avoid any deeper thought, to block any deeper conversation. Behind that lies a deep collective neurosis. The carpenter and other workshops contribute their share with hours over hours of cutting and sanding, drilling and banging. 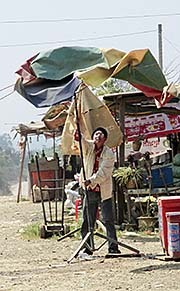 Now, where Chinese New Year approaches, are everywhere groups of mannerless brats around with firecrackers. They start in the morning and do that until long after sunset. BANG, BANG, BANG. It chases all the many awful, horrible spirits away who only live in the skulls of these miserable people and are part of them. I have never seen an adult criticizing the kids for doing that. The place is haunted at nighttime and in the early mornings by gangs of semiferocious dogs who make a great rattle when one is passing by. Almost any household keeps at least two or three dogs. The way how humans shape their environment is, no doubt, an outer expression of their inner constitution. Going up to Veal Veng wasn't an easy thing. Staying in Pursat, I had to wait two days to get a lift. 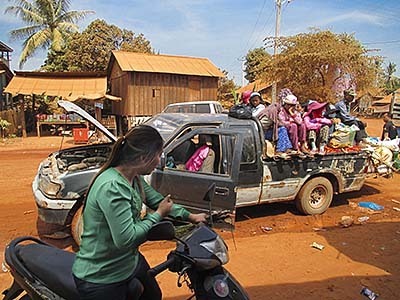 There is only one taxi car going per day, and the drivers seem to prefare Khmer villagers over barangs (see: farangs), whom they also overcharge. Making it worse, it was the time short before Chinese New Year, when all the locals go home and the transport system is more overcrowded than normal. 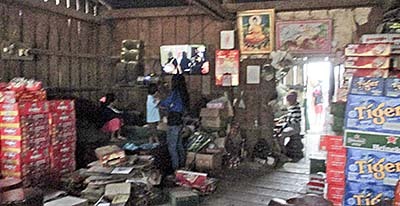 Fortunately, there was a farmer going up, who loaded his pickup with piles of Angkor beer boxes who gave me a lift. The drife was another nuisance in the crowded, dirty car which was ever more messed up by the locals and their brats with all the superfluous stuff they carry and who start eating fruits while driving and littering the vehicle full. Soon later the first kid started vomiting. The mother, though, couldn't see a connection between feeding the child in the car and the brat getting sick. The road is very bad, but under improvement. One get's a lot of dust to swallow. The dust is anyway a permanent accompanist in the mountains. The trip took about five hours. That had to do with the stop-and-go style of the driver, picking permanently people up or dropping others, or having a halt for a small talk. An American fellow traveller told me he made the way up on a Honda Dream from Pailin, within one day. The third access is from Koh Kong, but that is the longest way which leads via Ou Soum. Hiking over a day deeper into the forests, I saw several animals. Many birds, among them a couple of hornbills, a squirrel, a group of monkeys high up in the mountaintops, seemingly macaques. Also two peasant dogs who certainly didn't do any good for the wildlife. The villagers dogs mean another threat for the nature. Strange enough, as always, particularly in the forests I saw rarely wild animals. 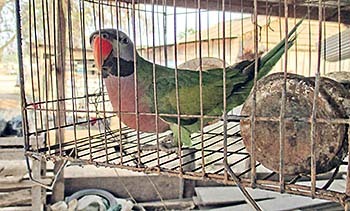 Most animals I see appear on roads or in captivity. In the forests they are always well hidden or they come out only at dusk when I leave the forest. Being in the forest one comes sometimes to spots where swarms of mosquitoes approach. Here it happened only at one spot for a short moment. Wherever one can go, means using roads, paths, tracks, there is the same picture of natural destruction present. Everywhere pillars of smoke rise into the sky. That happens non-stop, day for day for day. 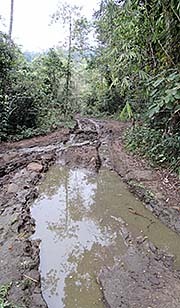 Permanently tracks and roads are extended to allow people accessing ever deeper into still untouched parts of the nature. No doubt, also in nighttime are hunters in the forests to catch or kill those animals who are not out in daytime.